So off to my cookbooks and google, searching for Peruvian food that I think my family will love and I came across this chicken wing recipe, it looked great, the ingredients were easy to find, and it was simple, I had to try it. These are delicious. So delicious that when you think you are done eating, you just have to have one more. 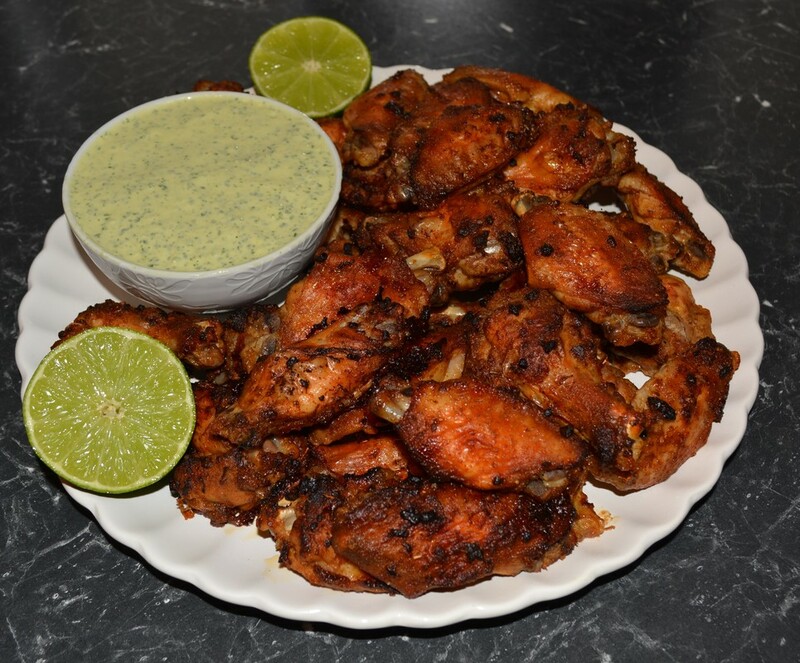 Now the wings alone are great, but my oh my pair it with this green sauce and they are amazing. And if you are one of those people that say, I don't like coriander, try this, you will love it, the green sauce is so good, I could it all the time. You could bake these on a wire rack, but I hate cleaning those, so I do it on a baking paper lined tray and turn them half way through cooking, you choose how you want to bake them. You could do this with a whole roast chicken also, but I have to say, I do love my wings. I made this with 2kg of chicken wings without doubling the marinade or sauce. ​Instead of mixing the marinade in a bowl, I sometimes just make it in the snap lock bag and rub it all together in there, saves a bit of washing up. So my new food adventure has given me a great new recipe that I will be serving to family and friends for many years to come. Prepare the chicken by placing the oil, garlic, cumin, salt, sugar, paprika, coriander, oregano, pepper, juice and zest of the lime in a small bowl and stir until well blended. Place the chicken wings in a large ziplock bag and pour the marinade over them. Seal the bag and then “massage” the chicken to make sure the marinade coats the chicken completely. Refrigerate for 1 hour or up to 4 hours. Preheat the oven to 200C/180C fan forced. Line a baking tray with baking paper. Lightly oil the paper. Once the chicken has marinated, place the wings on the tray, leaving space between each wing piece. Bake in the oven for 45-50 minutes or until the wings are cooked through and slightly charred on some of the edges, you will need to turn them over, halfway through cooking. ​While the wings are baking, place all the ingredients for the green sauce in a small food processor. Process until all ingredients are well blended. Pour into a bowl, cover and refrigerate while the chicken is cooking. The sauce will seem thin but will thicken up as it sits. Serve with the chicken with the green sauce.